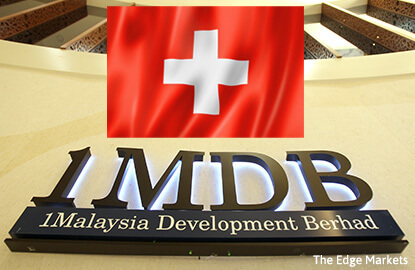 KUALA LUMPUR (Oct 5): The Office of the Attorney General of Switzerland (OAG) has made a fresh request for mutual legal assistance from the Malaysian authorities in relation to the money trail involving 1Malaysia Development Bhd (1MDB). Noting that its initial request to Malaysia made in January is still pending, the OAG said the new request comes as part of the criminal proceedings opened in August 2015. In a statement today, it said investigations have revealed that substantial amounts were misappropriated from Malaysian government-owned SRC International Sdn Bhd, and that fraud was committed based on a form of "Ponzi" scheme. "On analysing the evidence obtained, the OAG identified further suspect transactions involving the Swiss financial sector. "Firstly, the sum of US$800 million appears to have been misappropriated from investments in natural resources made by the SRC sovereign fund. "Secondly, it is suspected that a 'Ponzi' scheme fraud (i.e. paying the returns on initial investments from funds obtained from subsequent investors rather than from legitimate revenue from the investments) was committed to conceal the misappropriations from both the SRC fund and from 1MDB," said the OAG. These suspected misappropriations from 1MDB were the subject of the OAG's first request for mutual legal assistance to the Malaysian authorities, it said. "The aim of the OAG's latest request is therefore to obtain further evidence in corroboration of the latest findings, in addition to the assistance requested in the OAG's initial request of January 2016, which is still pending," it added. The OAG said it has also requested assistance from the Malaysian authorities so that the presumed companies or persons suffering harm can assert their rights in the Swiss criminal proceedings. Based on these new suspicions, the OAG has also addressed an additional request for mutual legal assistance to Singapore, following an earlier request made in April 2016, it added.